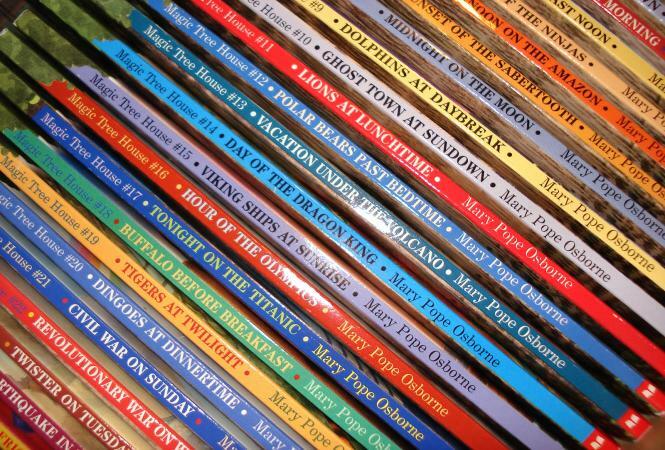 The Magic Tree House is a series of chapter books written by Mary Pope Osborne. Each story takes readers on a time-travel adventure to a new place around the world. The success of the original series led to three additional sets, Merlin Missions, Fact Trackers and Super Edition that feature the same main characters and offer a wider range of reading levels. Sibling explorers, Jack and his younger sister, Annie, discover a tree house. Adventurous Annie enters to discover a plethora of books. They soon realize these books in this tree house can magically transport them anywhere they wish to go, even back in time. 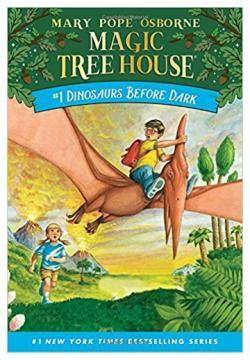 The original Magic Tree House series includes 29 books. Dinosaurs Before Dark (1992): Jack and Annie discover the magic tree house and get acquainted with real, live dinosaurs. The Knight at Dawn (1993): Transported to the Middle Ages, the siblings explore a castle and befriend a knight. Mummies in the Morning (1993): Jack and Annie travel to Ancient Egypt to aid a Queen. Pirates Past Noon (1994): A visit to the Caribbean Sea results in the discovery of who has been responsible for the tree house's magic. Night of the Ninjas (1995): A friendly mouse and an evil spell take center stage in this Japanese adventure. Afternoon on the Amazon (1995): Jack and Annie must find a magical object in the Amazon rain forest. Sunset of the Sabertooth (1996): The explorers meet tigers, mammoths and cavemen in the last ice age. Midnight on the Moon (1996): Jack and Annie travel into the future and explore the moon. Dolphins at Daybreak (1997): Can the adventurers make friends to help them survive in the middle of the ocean? Ghost Town at Sundown (1997): The Wild West sets the stage for new friendships and discoveries. Lions at Lunchtime (1998): The African Savannah challenges Jack and Annie's survival skills. Polar Bears Past Bedtime (1998): Meet native arctic creatures and people as the explorers try to survive freezing temps and cracking ice. Vacation Under the Volcano (1998): Mount Vesuvius is about to erupt in Pompeii, will Jack and Annie survive? Day of the Dragon King (1998): Meet the Dragon King in ancient China circa about 2,000 years ago. Viking Ships at Sunrise (1998): Find out if medieval Ireland is full of friends or foes. Hour of the Olympics (1998): Can Annie find her way into the boys-only Olympic Games in ancient Greece? Tonight on the Titanic (1999): The ship is destined to sink, but be Jack and Annie can save the people? Buffalo Before Breakfast (1999): Roam the early American Plains with natives and buffalo. Tigers at Twilight (1999): Head back in time to the jungle in India. Dingoes at Dinnertime (2000): Jack and Annie seek the final gift for their magical mentor in Australia. Civil War on Sunday (2000): Learn from legendary nurse Clara Barton in the American Civil War. Revolutionary War on Wednesday (2000): History be rewritten if Jack and Annie don't help General George Washington. Twister on Tuesday (2001): The explorers get up close and personal with tornadoes on a prairie in the American Midwest. Earthquake in the Early Morning (2001): Travel to San Francisco in the early 1900s to experience a real earthquake. Stage Fright on a Summer Night (2002): Jack and Annie meet William Shakespeare, but can they be great actors? Good Morning Gorillas (2002): Living with gorillas isn't always easy in the Congo. Thanksgiving on Thursday (2002): Learn how to feast like a true Pilgrim at the first Thanksgiving. High Tide in Hawaii (2003): Jack and Annie encounter an unbelievable natural disaster in Hawaii's past. A Big Day for Baseball (2017): Check out Jackie Robinson's first Major League Baseball game with Jack and Annie. Books 1-28 can be purchased in a box set for just under $300 through BMI Educational Services, Inc.
To extend the opportunities for learning, original author Mary Pope Osborne teamed up with her husband, Will Osborne and sister Natalie Pope Boyce, to create Magic Tree House Fact Trackers (formerly called Research Guides). There are currently 38 of these nonfiction companions offering complimentary factual information about the times, places, people and creatures featured in the original series. Fact Trackers were published from 2000-2016 with each serving as the companion to a particular book in the original series. The first 35 books are available in a box set for just under $400. After learning of Jack and Annie's uncanny abilities, famed Magician, Merlin, enlists their help. At twice the length of the original series, Magic Tree House Merlin Missions are designed for the next level chapter book reader. The books in this series were originally numbered successively after the original series from 29-55. After the 25th anniversary of the originals, they were renumbered starting with one and grouped as a new series with 27 total books to date. Christmas in Camelot (2001): Jack and Annie do what they do best, use their imaginations, on a Quest for Camelot. Haunted Castle on Hallows Eve (2003): The adventurers discover new abilities as they try to save a duke's castle. Summer of the Sea Serpent (2004): Can Jack and Annie find the Sword of Light in time? Winter of the Ice Wizard (2004): Merlin and Morgan need Jack and Annie's help, but first they must deal with the Ice Wizard. Carnival at Candlelight (2005): Venice, Italy is in trouble and the explorers must use all their resources to help. Season of the Sandstorms (2005): The desert in the Middle East offers new wisdom to the sibling team. Night of the New Magicians (2006): Meet four famous scientists from the 1800s. Blizzard of the Blue Moon (2006): What do a unicorn and the Great Depression have in common? Jack and Annie of course! Dragon of the Red Dawn (2007): Travel to Japan with Jack and Annie to discover one of Merlin's four secrets of happiness. Monday with a Mad Genius (2007): Leonardo da Vinci enlists the help of the siblings while they search for the next secret of happiness. Dark Day in the Deep Sea (2008): After traveling to a deserted island Jack and Annie help some sea scientists. Eve of the Emperor Penguin (2008): Can penguins in Antarctica help Jack and Annie in their search? Moonlight on the Magic Flute (2009): The adventurers party with Mozart in Austria. A Good Night for Ghosts (July 2009): Discover the world of jazz in New Orleans. Leprechaun in Late Winter (2010): Can the kids stop sadness from leaving a storyteller with no inspiration? A Ghost Tale for Christmas Time (2010): Get to know Charles Dickens along with the siblings. A Crazy Day with Cobras (2011): Jack and Annie travel to cobra-filled India in search of ingredients for a spell. Dogs in the Dead of Night (2011): The Swiss Alps set the stage for some canine adventures. Abe Lincoln at Last (2011): Jack and Annie travel back to the Civil War to assist Abe's friend. A Perfect Time For Pandas (2012): Jack and Annie search for special foods in China, but an earthquake threatens their mission. Stallion by Starlight (2013): A young Alexander the Great proves to be less than great. Can Jack and Annie help? Hurry Up Houdini (2013): Can the adventurers find legendary escape master Harry Houdini? High Time for Heroes (2014): Jack and Annie find Florence Nightingale in Egypt. Soccer on Sunday (2014): Can Jack and Annie find famed soccer player Pele at the crowded 1970 World Cup? Shadow of the Shark (2015): Jack and Annie attempt to have a nice, relaxing vacation. Balto of the Blue Dawn (2016): Famed Alaskan husky, Balto, needs Jack and Annie's help to save lives. Night of the Ninth Dragon (2016): Jack and Annie must solve a riddle to save Camelot. A box set of books 1-25 sells for under $100 at Barnes and Noble, while the two most recent books can be purchased individually. The first Super Edition book, Danger in the Darkest Hour, was published in 2015. This offshoot of the original series still features main characters Jack and Annie but boasts longer stories and more dangerous adventures. 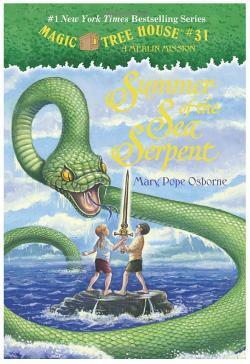 The Magic Tree House series, editions and companion books offer countless hours of educational fun for young readers. With over 90 books, this series has something for several reading levels and most historical topics of interest to kids.